Anyone who has visited Palermo will tell you that its labyrinthine streets and, lets face it, air of grandeur past, faded into a apathetic and grimy present, makes for a challenging exploration. Whilst walking around the maze that is the old city, we stumbled into the old Arab neighbourhood of Kalsa. We were here to see the stunning “Trionfo Della Morte”, or Triumph of Death Fresco. Down a small alley is the unassuming entrance to the Palazzo Abatellis, which houses the Regional Museum of Sicily. 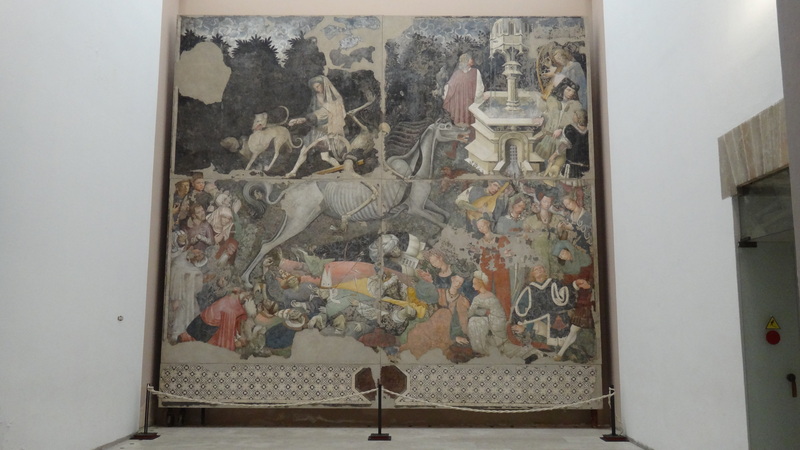 And one of the crown jewels of its collection is the Triumph of Death fresco, representative of the late Gothic Italian style, dated around 1446. It was originally in the Sciafani Palace in Palermo and thought have been commissioned by the Aragonese King Alfonso of Naples, who had rebuilt the Palace to house a hospital. In order to facilitate its removal and transfer, the fresco was divided into 4 parts, with the quartered edges showing wear and tear. Oh…and we don’t know who the artist is. 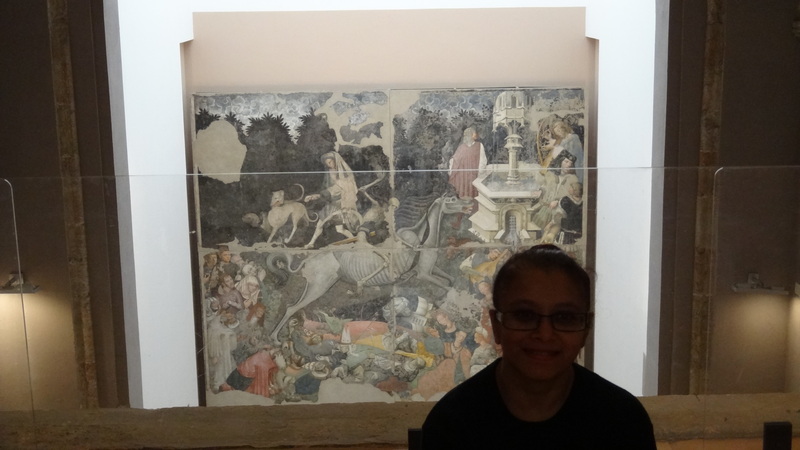 When you find yourself in front of the fresco, you are immediately struck by two things. The first is the forceful style and stunning visual imagery that literally takes your breath away. And the second, more allegorical observation. That the work beautifully sums up the futility of human existence. At the lower left is a group of mostly impoverished people who seem to be imploring Death to spare them. Look closely and you will see that the artist has allowed himself one moment of narcissism by painting himself into the scene. He is holding a brush, and to his left is probably an apprentice. Directly below the horse are the victims of Death, lying in grey pallor, with their limbs in disarray, arrows notched into their bodies. We see all walks of life represented – nobles, clerics, kings; no now is spared. A sobering reminder of Death as the great leveller. At the upper right are a group of musicians and a falconer around a fountain, seemingly oblivious to Death’s advance. Below them is a richly dressed group, who look to be shocked at the advance of Death into their midst. A musician, who was probably serenading the group moments before, is now cowering in fear. Others, cocooned by their furs and trimmings, luxuriate in their youth, turning a blind eye to the universal truth until it is literally thrust upon them. It has been surmised that the fresco depicts a time when the bubonic plague spread through Mediterranean cities by way of the sea ports that facilitated trade. It struck Palermo with alacrity, decimating half the population of the city. Seen in this light, the fountain may signify the importance of hygiene and washing. Among the survivors in the lower left group is a man in purple with bandaged hands, who may be a doctor taking precautions to avoid contagion. Or he could be a leper, who survived because they were isolated from the rest of the population. It has been stipulated that the bow seen in the hands of Death is a type found in Asia, suggesting that Death rode in from the East, which is in line with the historical narrative that the plague spread into Europe in the shadow of the waning Mongol empire. Nothing, it seems, changes. We desperately chase all manner of material satisfaction, ignoring the ticking down of the seconds in our life clock. We choose to bury our heads in the sand. When you look at this magnificent work, its easy to find yourself wondering whose hand it was that crafted it. It is said that the horse in the work inspired the one in Picasso’s Guernica. And Pieter Brueghel, who travelled to Italy in the early 1550s may have been influenced by the work in realising his own Triumph of Death. But ask of the artist who has painted this masterpiece, and we are only left with silence. 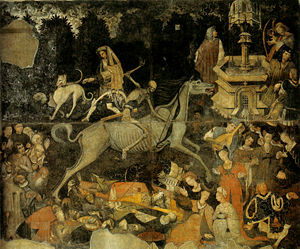 What : Fresco titled Triunfo Della Morte (Triumph of Death), painted around 1446 in late Gothic Italian Style, 5.9×6.4 meters, by unknown artist. When : Timings vary, best to check with the museum beforehand. Why : A jaw dropping work of art that will resonate with you long after. Do : After a close viewing of the fresco, make your way up to the gallery where you can get a stunning overview. Don’t : Expect a audio guide, or a lot of information in English. Its better to go prepared beforehand with information on what you will see to get the most out of your visit. to one that connects to the grid (feeds power back).